Netflix has announced a partnership with Razer to bring support for HDR10 and Dolby Digital Plus 5.1 to the Razer Phone, marking the first time that a mobile device supports both premium formats. As the Razer Phone has only two front-facing speakers, the audio will be downmixed from the 5.1 stream, though the phone—at least on paper—has one of the most powerful speakers available. The Netflix / Razer partnership also brings a special widget which allows subscribers to watch videos from their home screen. I'm unsure who exactly spends time just looking at their home screen—bringing picture-in-picture support would be preferable, though that requires Android 8.1, which has not yet been released for the Razer Phone. Naturally, content delivered in this format necessarily uses a very high bitrate. Here's to hoping you have either unlimited data or a strong Wi-Fi signal to take full advantage of these features. LAS VEGAS (CES 2018) – Razer™, the leading global lifestyle brand for gamers, today announced that Netflix will be supported in HDR and Dolby Digital Plus 5.1 on the Razer Phone. 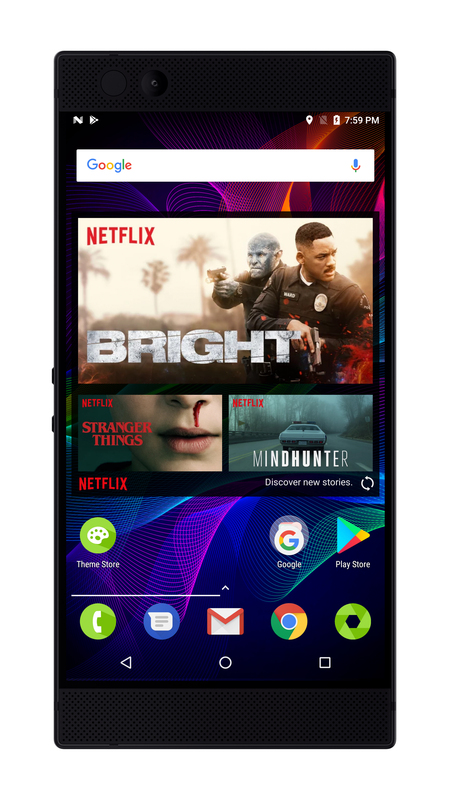 The Razer Phone now stands as the first smartphone to support both premium audio and video formats for Netflix. Netflix members must be subscribed to the premium plan to watch in HDR, which includes titles like “Bright,” “Stranger Things 2” and the entire Marvel series.